Animal Shelter “Mežavairogi” has been opened in 2009. Every year, they take more than 2,000 animals from all over the Latvia. It is one of the very few shelters in the country that houses both wild and domestic animals. Besides more than 100 dogs and 80 cats, the “Mežavairogi” shelters pets: horses, goats, cows, rabbits, various domestic birds; wild birds such as owls, buzzards and wild animals: raccoon dogs, raccoons, coatis, ferrets, martens, minks, foxes and brown bears. As you can probably see, this live stream is concentrated on the latter. 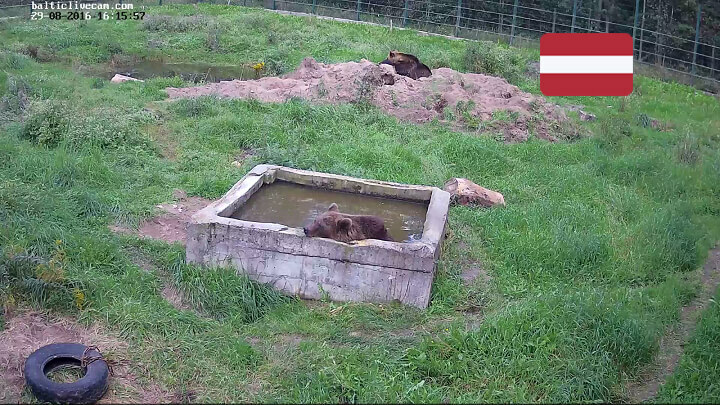 The camera is placed in the open-air enclosure of the two she-bears – Laima and Mara. These brown bears were rehomed to the “Mežavairogi” shelter on 22 June 2010 from the Riga Zoo branch in Kalvene. Both bears were born in 2004. They are mostly active during the day, when they love to walk around on the territory, swim in their little pool and eat apples. However, sometimes the enclosure needs to be cleaned up and the bears move inside their little house for a day or two. They sleep inside as well, so they will not be out on the street during the winter. The history of this shelter’s unique variety of animals started back in 1999, when a little striped piglet was brought in to the shelter. Since then, dozens of different animals were brought in. Due to that, the shelter has been advertising itself not only as a sanctuary, but also as a mini-zoo, because a lot of the wild animals cannot be adopted. Besides, people started to visit the shelter more often, walking, playing and feeding different animals there. 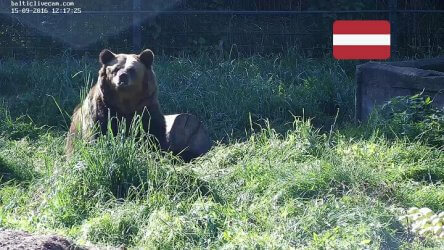 As it has been said, the “Mežavairogi” shelter is not only for bears – numerous animals have to be fed and some of the pets are waiting for their new loving owners. That’s why you can help out all of the numerous inhabitants of the sanctuary by buy pet food here, online, which will be delivered straight to the shelter. Home made jam and honey are very important nutriment for bears. Fresh vegetables are the main nutriment for bears. Especially carrot directly from the farms. Fresh red apples are very important nutriment for bears directly from farms.